This is only a mini reveal. We'll be doing a ton more to this room shortly as Avery needs to move to a big girl bed. She has exceeded the height requirements for the crib, but she has yet to realize she can probably climb right out. 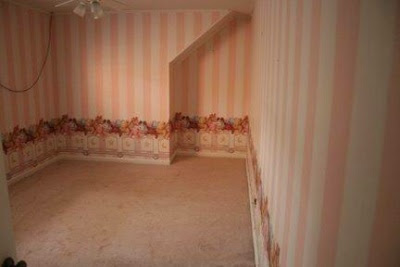 Here's the unfortunate, peeling 80's wallpaper we had to start with. Once we got the hang of it, the removal really wasn't all that bad. Luckily, in this room, they had primed the sheet rock, but the bathroom we tackled next was not as pleasant. Ta da. Like I said, nothing on the walls yet, but it is still quite an improvement. In other news, the pretty county road I mentioned we had used to walk turned out not so good. There are a couple houses that just let their dogs out loose. I figured they would get used to us, but the last time we walked by they seemed a tad more aggressive. I'm sure they are more bark than bite, but I'm not willing to risk it with Avery. There is a great park a short drive away that Avery and I have gone to for walks now. The other day we were surrounded by blue birds, red birds, and blue jays. We even spotted a deer. I haven't ventured to take Bella yet. The loading and unloading of dog, baby, and stroller is not my favorite part. Talk about exercise before you've even really started! We tried toddler time at the Library today, but it was cancelled. Luckily, most of the other parents didn't know that either. We ended up getting invited to let the kiddos play at a local gymnastics activity center. Avery had a blast. I'm hoping we can sign her up for a class. We're looking forward to visiting a church this weekend, so we're doing our best to get ourselves established here. I'm off to unload another box! Wow that is such a fantastic transformation! Just curious, it's a rental house isn't it...is the owner paying for the improvements or are you just wonderful tenants? I wish Vik! It is a rental, but I just can't stand to leave things as is. We are getting a discounted rate for improvements we made to the kitchen. I'll be sharing some of that soon.